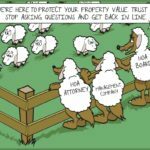 Arizona Homeowners Coalition | HOA TRUTH. » Does an alternative to HOAs exist? Is there an alternative to HOAs? One where the homeowner has more control over his own home, but where the common areas (Open Spaces) are paid for and maintained by the homeowners? Dear Need Alternative to HOAs. The answer is YES. An alternative to HOAs is the Improvement District. Single family housing can be managed by either public management or private management (contractual governance schemes) called HOAs. Prior to the 1960’s overwhelmingly all single family housing was managed through local governments paid through local property taxes with only a few hundred voluntarily created HOAs in existence. This changed in the mid 1960’s as the economics of land, the entrance of large corporate builders and government intervention forever changed the future of housing as the era of public/private partnerships began. …But local HOA mandates aren’t the only governmental intervention. For decades, the Federal Housing Administration has indirectly subsidized the creation of HOAs by giving buyers easier access to mortgage financing when buying into an HOA community. Government policies have caused developers to oversupply HOAs to meet artificial demand for HOA communities. When HOAs are created to satiate government bureaucrats, rather than homeowners, it shouldn’t be surprising that many HOA communities are neither well-crafted nor homeowner-friendly. But, the solution to the HOA problem is not more government intervention. It is less. The first step is for government to stop mandating and subsidizing the creation of HOAs. As corporate builders and government intervention grew, consumers no longer dictated the type of housing management to be used. Instead local governments decided a “one form of private governance fits all” housing policy would be best. Who are HOAs best for? “What most people don’t realize is that the main purpose of a community association is to defer municipal financial and maintenance responsibilities from the public sector, by placing these obligations in the hands of the residents of the community,” Bolen said. “This privatization of public functions allows the continued development of housing and infrastructure without having to increase taxes for a municipality’s citizens.” Josh Bolen, esq., a litigation partner for Carpenter, Hazlewood, Delgado & Bolen, PLC. Some forms of housing such as Condominiums and town-homes must have private governance and some single family housing such as ones with private streets and special amenities also need HOA governance. Because most local governments require subdivisions that are gated to have an HOA because the local governments cannot regulate and maintain private streets. Also subdivisions with special amenities such as air parks, large lakes, golf courses and those that own commercial property are all examples where privatize housing would be the best practice because local governments don’t what to own and maintains these specialized amenities. SB1402 is about Improvement Districts. The goal is to return CHOICE to the housing marketplace after being denied control for decades in an effort to satiate local bureaucrats at the cost of meeting the demands of the consumer market place. Even after consumers in independent surveys have said 60% to 80% of the time that they want single family housing not under the control of a private association. Because after decades of use consumers have come to realize that HOA managed housing is a big liability with ever increasing expenses and abuses instead of the industry claimed “To make better Community” or “To protect property values.” In addition a recent local survey has shown that housing under Improvement District management has overall higher property values then homes located in HOA managed neighborhoods. Which also means that local governments have lost both property and sales tax revenues by not having more housing under Improvement District control and because of that they have lost millions and likely tens of millions over the years for not doing so. Finally, although private housing management through HOAs has proven to be a “fundamentally unworkable” solution, local governments have refused to reevaluate their decade’s old housing policy and use other forms of housing available to them. SB1402 attempts to change today’s, one sided housing policy by mandating that local governments provide an alternate zoning code that allows builders to build single family housing neighborhoods without land owned in common. However someone still must own and maintain the landscaped areas, retention basis, street rights-of-ways, entrance monuments, parkways and parks etc. so public funds don’t have to be used. This has been successfully accomplished in the past through “Improvement Districts” that don’t have Boards, or architectural rules or eliminate the Homestead protection of the lot owners. Simply stated: Improvement Districts provide ownership and maintenance services paid for by a district tax that is significantly lower in cost than an Associations assessment. With participation from District residence and managed by public managers but without all the other baggage, liabilities and higher expenses that comes with HOA management. Do you have a story for Dear AZHOC or want to be part of the movement to restore homeowner’s rights? Contact us now at AZHOC.org/contact/. If you are referring to Alternatives to HOA Management, i’d like an answer as well. Such as, Is anyone self governing? I’ve thought about maybe having an Accountant take over the bills and dues and go to self govern. Has anyone done this? there are greater than 9500 HOA’s and Condo’s in Arizona. About 5000 are professionally managed by Management companies that belong either AACM or CAI . The remainder are either managed by management companies without professional affiliation and many times training and certification. The remainder are self managed. Where the board does the work them selves or simply hires a CPA to do the financials and a secretary to manage the records. While professional management with organizations certified by one of the two trade organizations is better than the fly by night organizations I’ve seen too many incompetent certified community managers to put much faith in them. Being self managed by board members that truly want to help the organization and do things in the best interest of the community would be far better than trusting your money and community to the fly by night management companies. Being self managed is surely an option for smaller HOA’s or Condo’s, but you must do that with your eyes wide open. This takes real work, managing records and business contracts as well as supporting the needs of your community, it is not just about getting an accountant to handle the finances. It also takes a commitment to know and understand the laws and the community documents. While we see issues with many if not most so called professional management companies, the possibility of even worse issues come up with self managed communities because the board members do not take or have the time to stay current with the laws governing you community, and in doing so infringe on the rights and due process due each homeowner. What the article is however dealing with as a viable option to HOA’s in total called improvement districts. The only municipality that we know of in the state is the City of Gilbert that allows these options for developers. We have tried for three years now to make communities at least allow this option to any developer building one of these common interest communities, but so far have been unsuccessful at getting these bills passed. (3) The imposition of a fine or any other penalty against a unit’s owner for a violation of a use restriction. (c) Other areas that the governing body requires to be used for the purpose of collecting, facilitating, retaining or channeling storm water drainage of the residential property of the common-interest community. (c) The governing documents of the association authorize the residents to farm or raise livestock on the residential lots. (a) “Governing body” has the meaning ascribed to it in NRS 278.015. (b) “Landscaping” has the meaning ascribed to it in NRS 278.4781. (c) “Public lighting” has the meaning ascribed to it in NRS 278.4783. (d) “Security wall” has the meaning ascribed to it in NRS 271.203. (e) “Trails, parks and open space” means trails, parks and open space that provide a substantial public benefit or are required by the governing body for the primary use of the public. The term does not include a private street or roadway, gated entry, swimming pool, gazebo, clubhouse, pond, tennis court, miniature golf course or frisbee golf course. (f) “Use restriction” means any provision of the governing documents of an association that restricts a unit’s owner in the use of his or her unit. Thanks Jenn for your comment. While I’m constantly searching other state statutes for possible relevance and applicability for Arizona. This concept would apply mostly for what we call Property Owners associations in Rural Arizona, that are currently governed under Planned community statutes. The one concern is the primary expense for our property owners associations are roads and road maintenance is excluded in Nevada’s Limited purpose associations. While the concept is interesting any attempt to create such an option could never be applied to existing communities and I cannot see a major land owner subdividing his/her land and creating an organization with maintenance responsibility with covenants that are not enforceable by the association. Our improvement district would not have an association providing the maintenance it would have a municipality, and covenant enforcement would be done by homeowners just like your limited purpose association. Thank you Dennis for all that you are doing and your comment above. I am for anything — Improvement Districts, Landscape Associations, anything — to stop the CC&Rs extortion racket and the high-stakes abuse of innocent good-faith homeowners like me. I also don’t think critical infrastructure like public roads should be in the purview of an HOA, but that is a whole ‘nother huge topic. I now, mercifully, live in a non-HOA neighborhood; the City repaved our roads about a year-and-a-half ago, the street sweeper comes by every week, the trash gets picked up, the sewers are tended, etc. It works great, and I don’t have to be tormented and threatened by psycho board members, unscrupulous management companies, and crooked HOA lawyers.